I live in the midwest where it's sunny, humid and hot. How to I keep my basil from bolting? They are in pots on the deck. Frequent harvesting will help to keep them from bolting. 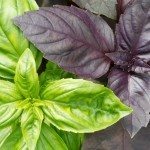 Even if you don't plan on eating it right them, basil freezes well, so harvest as much as you can. If in pots, water 2 times a day to help keep the soil cool. Hot soil encourages flowering. I have even known people to place 1-2 ice cubes on top of the soil to cool it down some.